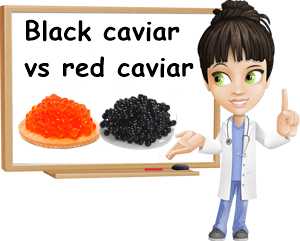 The biggest difference between red and black caviar is they are made from the eggs of different kinds of fish. 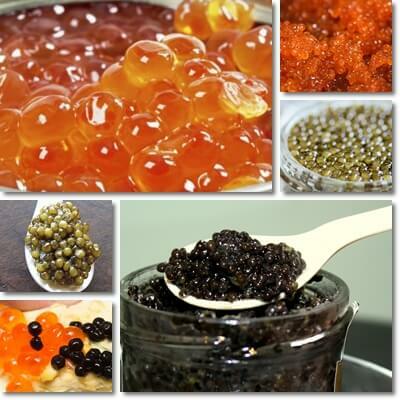 Black caviar is traditional caviar and is made exclusively from sturgeon roe. Red and sometimes orange caviar is an affordable version of real caviar and is typically made from salmon roe, but also cod such as whitefish, trout, lumpfish and other species of fish that are not sturgeon. Because of the massive decline in sturgeon populations in the wild, black caviar is being sourced solely from farmed sturgeon. Actually, except for old caviar reserves since well before the decline in sturgeon populations that lead to the ban on fishing the species, currently black caviar can legally be sourced solely from farmed sturgeon. In addition to the exorbitant difference in price, black caviar being so much more expensive, there are notable differences in taste as well mainly because black caviar comes from older sturgeon fish and can be aged so that it may develop particular flavors. Whereas red caviar options are sourced from younger salmon, cod, trout, lumpfish etc. and don’t offer the same exquisite taste experience. 1) By definition, authentic caviar can only come from sturgeon roe, or the eggs of sturgeon fish. Anything other than sturgeon is not technically caviar or, at least, not traditional or authentic caviar. 2) Sturgeon roe is not naturally red. It’s different kinds of grey to black and, in rare instances, grey-brown, golden with olive undertones, actual golden or silver. But not red or tones of red. 3) Because it’s made only from sturgeon roe, traditional, authentic caviar is naturally black or, at least, darker shades of grey (for the most part). Beware of dyed fish eggs that are being passed off as sturgeon eggs even though they aren’t. Example: lumpfish. 4) By definition, red caviar isn’t real caviar. At best, it’s an affordable version. At worst, an imitation. 5) Real, black caviar typically has smaller eggs. Salmon eggs, one of the most common sources of red caviar, are larger. 6) Although affordable options can taste good too, authentic black caviar should taste more exquisite compared to red caviar. If it’s aged, there should be mild nutty, even buttery, faint sweet flavor notes, a pleasant fish taste with a briny, more exquisite seafood aroma. Quality red caviar should taste good too, not too fishy, not too salty either, although it isn’t usually described as exquisite. 7) Traditionally, authentic black caviar is either fresh or aged and only lightly salted. Nowadays, it may also be pasteurized, but this takes away from the taste experience. Quality red caviar is also only lightly salted, either fresh or pasteurized. But if it isn’t very high quality, then it can have added flavors from spices to condiments such as mayonnaise. 8) Lastly, a big difference between red and black caviar is price. The latter can easily sell for tenths of thousands of dollars per kilogram. The reason why black caviar is so expensive compared to red has to do with the high demand for it paired with the decline in sturgeon populations leading to the ban on their fishing as well as the fact that sturgeon are long-lived and, as a result, mature late at about 15-20 years. 1) Sturgeon eggs: Source of traditional, authentic black caviar and color variants: grey, grey-brown, golden brown with olive undertones and rare golden and silver. Sourced from Beluga (Huso Huso), Kaluga (Huso dauricus), Siberian sturgeon (Acipenser baerii), Sevruga or starry sturgeon (Acipenser stellatus), sterlet sturgeon (Acipenser ruthenus), Ossetra (Acipenser gueldenstaedtii), hackleback or shovelnose sturgeon (Scaphirhynchus platorynchus) and other species. 2) American paddlefish eggs: May or may not be considered true caviar. This is because Polyodon spathula is not a true sturgeon, but a relative of the sturgeon fish species. It is however marketed as caviar and because the fish eggs are black with a greenish tinge, it looks the part too. 3) Salmon eggs: Not a true caviar, although marketed as one. Salmon eggs have a bright red-orange color and are larger compared sturgeon eggs. They make for a pleasant taste experience because of the larger size of the eggs. 4) Trout, cod such as whitefish are also marketed as red caviar. Since they are not sturgeon eggs, they are technically more of an affordable version or substitute rather than the real thing. 5) Lumpfish eggs can be dyed either red or black to mimic both red and black caviar varieties. In addition to dyes, they may contain food additives such as E211 to prolong shelf life. Ideally, choose fish eggs without additives. Considering that the two products are sourced from different species of fish and sometimes undergo different degrees of processing, it’s expected there will be some differences in nutritional value. However, these differences are minor and should not impact one’s nutrition, health and well-being visibly, especially in the small amounts the fish product is meant to be consumed. Overall, both black and red caviar stand out as important sources of healthy Omega-3 fatty acids in the form of EPA and DHA which are essential for brain health and hold anti-inflammatory properties. Nutritionally speaking, caviar is an important source of vitamins A, D and E, vitamin B12, sodium, selenium and iron and contains smaller amounts of vitamins B1, B2, B3, B5, B6, B9, calcium, copper, iodine, magnesium, phosphorus, potassium and zinc. One tablespoon of caviar provides about 2.5-3 g of protein and 3-4 g of fat as well 75-95 mg of cholesterol with benefits for muscles and the nervous and immune system.